Today we celebrate the UPS ... and the DOWNS ... in our very special SWEET 16 Feature! Kent Kotal / Forgotten Hits (kk) – I’ve got to tell you, I really, really enjoy the new album. Carl Giammarese (CG) – Well, thanks – thank you. kk – I guess it’s got to be a little frustrating in a way – here you are, still creating brand new music … and yet you don’t really have the opportunity to showcase some of that music because you’re so locked in with what you do within the confines of The Buckinghams – you kind of have to do the same show every night and the fact that you’re still making brand new music is lost on the fans – it's a shame that they never really get to hear any of it unless they go to the website and see that it’s available. CG – I’ve said this many times – I’m grateful that The Buckinghams still have a following and our music is still well received by our fan base and the baby boomers – and hey, we’re still out playing because of that and they still come out and see us. We just did a couple of really successful shows here recently – one at the Raue Center in Crystal Lake, which was sold out and then we just came back last week from doing a show with Peter Noone in New Jersey at a performing arts center – and it was also sold out and well-received – so, you know I appreciate that – and, of course, it’s great to still be out there playing – it’s financially rewarding and it’s just what we do – and I would do it anyway but I have to be creative at this point in my life. That’s what keeps my sanity and keeps me going – is to do these projects like this album, “Living In The Moment”. You know, you do it out of love and I love to write songs and I always say that when I get into a project like that – and this took me a little over a year to finish it – I was on the road with the Happy Together Tour and other things – and so you do it whenever you have some leisure time to get back in the studio – and I have a studio in my house that I can do most everything that I need to do there – so if I get creative, I can get up in the middle of the night and go down and lay down a track or a vocal or whatever – but it really lifts me up. And when I do these projects I don’t have aspirations of this is going to be a million seller – it’s more a case that maybe a few people will buy it and listen to it and get into it and it’s just your creative side comes out – and that first got piqued back around 1970 when myself and Dennis Tufano had a duo, Tufano and Giammarese, and that was my first opportunity, really, to write songs and I was half of that duo and did half of that song writing and half of that singing and to see a song that you write come to fruition and come to record it and the great Lou Adler gave us that opportunity back then – you know, we didn’t have a tremendous amount of success with it, but it was like the first song we picked to be our first single was a song called “Music Everywhere”, which is a song that I wrote – and so that’s where – going all the way back then – that is where I first got excited about writing and making new music. Now the problem is that The Buckinghams’ audience – you know, the baby boomers – they want to hear the old songs and it’s really hard to make that transition – and a younger audience, the millennials or whatever, who buy music now, new stuff, they usually tend to go toward artists that they can relate to, in their own age group, so you know I’m sort of in that gray area – because I’m gray (lol) – but you do it. I think this whole collection of songs on this album - I think there’s ten songs on there – are all saying something that relates to some part of my life. I mean, as a writer, you know, sometimes there’s a part of some songs where you sort of make up – I’m not sure making up is the right word – but you just sort of put yourself in that place to try and write something about a particular thing – but mostly, like I said, all the songs are about very important things in my life. For instance, “A Better Me”, which is the third cut if I remember, it kind of goes thru all those things about your significant other supporting you thru all of life’s challenges and I’ve been very fortunate in my life to be one of those persons – I’ve been married a long time – so I’m fortunate to have one of those people in my life, my wife – so it’s dedicated to her, you know, “you are the one that I need – you always seem to understand – you always seem to have a plan” – are some of the lyrics that kind of hit the spot there, you know. So every song is something that has some significance in my life. The last song I wrote for the album was “Living In the Moment”, which turned out to be the title of the album and it’s like I find myself reflecting on the past quite a bit and it’s a reminder that, you know, being in The Buckinghams, after we finish a show we always do autographs or meet and greet people, the fans – and I appreciate this – it’s one of my favorite parts of the show – when people come up to you and say “You know, when you recorded ‘Don’t You Care’ I just met my girlfriend or my wife and I was doing this or doing that’ and you know we’re part of their lives from back then. You’re always reflecting back – and then I have a tendency where my wife always gets on me to worry about the future and thinking about what you’re doing next year – so what I’m getting at is that when you’re doing the show, you’re helping relive some of the shared memories of the past and then when you’re not doing a show, you find yourself thinking about the future and all these things - which means you’re never really living in the moment. We need to focus more on today and just enjoy our life - and that’s kinda what that song’s all about. kk- One of the things I REALLY like about the album is that you hit a bunch of different styles. I mean over the course of ten songs, there’s some bluesy stuff, there’s the one song that pretty much turns into a country hoe-down – you’ve got the gospel track – another has a little touch of reggae - these are things that you don’t get to do otherwise within the confines and restrictions of The Buckinghams – so I really enjoyed seeing you stretch a little bit and incorporate some of these other styles into your music. It was very interesting to see that side of you because we don’t get to see that in concert. It’s almost like you were able to cut loose a little more as you did this. So it’s really about that. kk – And see to me, that seems to me to be one that you COULD work into a Buckinghams show – tell a little bit of the backstory – this is you reflecting back on that very special time. CG – Yeah, I agree. One of the songs – “We All Need Someone To Love” – I thought would be a good Buckinghams song – and a fun one to play on stage because it’s the only track that has some horns on it. And I could work that in. I’m in a lot of places here with this LP – there’s a song, “Oh Lord, Make Me More Like You”, which I wrote many years ago when my father passed away – I think I wrote that song in ten minutes – and I did one version of that on a little album I did many, many years ago on another solo project – I didn’t think about it at the time – but I’ve had two different Christian Rock Artists record that song and make it part of their album – so I decided, Hey, I’m gonna do it again – and add a little more to it – and put some drums on it and make that part of the album. And there’s a cut, “I’ll Remember You”, which is about my brother and good friend, Jon Poulos, who was the original drummer and founder of The Buckinghams, and him and I were very close back in the day and it was one of the saddest days in my life when he passed away – it was 1980 – and he was only 33. So the song “I’ll remember you – will you remember me? I guess it’s just the way it had to be” – those lyrics definitely reflect on that whole experience – and thinking about what he would have been like today – so it’s a very personal cut. It’s also a track that, if Tufano and Giammarese could have still been recording today, it probably would have fit into our format and program. kk – Well, two of the songs – and I kind of singled these two out when I listened to the album for the very first time - “We All Need Someone To Love” and “What A Time We Had” – now “What A Time We Had” maybe not so much because it’s such a personal song – but BOTH of those songs, when I heard them for the very first time, I thought, “Man, this is EXACTLY like the kind of stuff that Eric Clapton has been recording over the last 10-15-20 years – they just have that very laid back, kind of bluesy (but not overly bang-you-over-the-head bluesy) feel to them - but over the last twenty years or so, Clapton just sort of fell into a groove where he kind of developed into a middle-of-the-road artist – and both of those songs – I can hear him doing BOTH of those songs as I listen to them. kk – Yeah, well, it’s true! Both of these songs fit his style perfectly. CG - Well to hear that is a real compliment. kk – Especially “We All Need Someone To Love” – the very first time I heard I thought, “Wow, Eric could record this song today and have a hit with it TODAY – and it’s funny in a way because things being what they are right now, Carl Giammarese probably couldn’t get a brand new song played on the radio because there are just too many restrictions in place that prevent that from happening – but if Eric Clapton were to record this track, I think you could have a hit song on the radio right now, simply because it had his name on it! CG – No, no Nick. Nick lives in Las Vegas and I had a few other bass players available – and I also play bass - so there really wasn’t a reason for Nick to fly in and record on this album – and Tommy’s still a very dear friend – we still see each other quite a bit and go to dinner when he’s in town – and I’ve always wished him the best with The Raiders – but to go back to something you said earlier, I agree with you about having an actual album in your hands – it’s a piece of material that’s “real” – and when you download I believe that people will listen to their downloads for a certain amount of time and then they just get rid of them and move on to something else – so nothing is ever really permanent, you know – it’s just that throw-away society we live in and because of that, music comes and goes – I come from a time when there were regular 33 1/3 Albums – and you had a collection of albums and I still have a collection – I don’t really listen to them anymore, but they’re there and I have them – so this download thing is still really new for me. kk- I also see something on the back here about “The Puppy Mill Project” and I didn’t know if that might be something you’d like to talk about during this interview – maybe an opportunity to fill other dog-lovers in on what you’re doing for that organization. CG – Sure! Well, on the back of the cd it talks about The Puppy Mill Project, which my wife Barbara and I got involved with a few years ago. She is a big part of and very instrumental in helping toward the success of "The Puppy Mill Project. We were approached and we're both animal lover, an animal activist – I love dogs especially – dogs and cats – but The Puppy Mill – Mothers of the Mill – is an organization designed to prevent and stop puppy mills – which is the abuse of particularly mother dogs that are confined in cages and only used in breeding – and they never have a life – they never get out - it’s all about selling puppies and it’s a terrible existence. Every $500 we raise takes one of these dogs out of the mill. So I did a photo session for it – and we have a coffee table book that you can go to that website and order it – and all of the proceeds go to the Puppy Mill Project. All the celebs are mostly from around Chicago – there’s beautiful photos that were done by this photographer, Karen Morgan, and she’s just a fantastic photographer – and so they put together The Puppy Mill coffee table book – and I’m in there along with my little dog Lucy and that’s what that’s all about. I’m always contributing to these different organizations, but that one in particular. And every year they have a fund-raiser that we go to and I’ve performed at it, just myself, with a band that they’ve had there – just done a few tunes and auctioned off some of my stuff – so it’s a good cause. Earlier you mentioned that it was AFTER The Buckinghams that you really started the songwriting part of your career. Were you encouraged to write with The Buckinghams - or did they pretty much have that down to where there was a certain sound they wanted and that was really all they were interested in? CG – They wanted a certain sound – and you didn’t have much leeway or much of an opportunity to write back in The Buckinghams because the sessions were pretty much controlled by the record label. I think everybody knows that The Beatles changed everything as far as self-contained bands, writing their own material, and performing their own music – but of course they were also so unbelievably talented so, of course, that helped quite a bit in their case, the fact that they were writing great songs. But we didn’t have much opportunity back in the day, back in the late ‘60’s – but our keyboard player, Marty Grebb, wrote a little bit and he was allowed to write a song that became a single with “Back In Love Again” and that was our first – well, we didn’t have a lot of success with that song – but at least it was something we did on our own – and it charted, and it was great that we got the chance to do that. kk – That’s actually one of my favorites by you, by the way! CG – Yeah, it’s – if I have any criticism at all about that song, it was the way Guercio produced it – I think the sound could have been better – the fidelity of it – I think Jim Guercio, who had produced all of the previous Buckinghams hits, was a great producer as far as being able to pull that sound out and make it sound great but I felt that even though the song was cool, the song was great, it could have been better recorded. kk – Punched up a little bit maybe? CG – Yeah – it just could have been a better mix. But when we broke up, the original band, by 1970, Dennis and I, as Tufano and Giammarese, were very much influenced by the singer-songwriter people that were emerging and that was what was happening at the time – Crosby, Stills and Nash, Jackson Browne, The Eagles a little bit at that time – I was a giant fan of Joni Mitchell and Carole King – and James Taylor – so you had these singer-songwriters coming out and it was a more personal sound – a more unplugged, acoustic-driven sound - great material – and Dennis and I started listening to a lot of that – boy, I was a big fan of Neil Young – “Harvest” – Cat Stevens “Tea For The Tillerman” – and God, we wanted to do that sound and so we got pretty influenced, I think, by that – and I think Dennis was pretty influenced by that, too, if I may speak for him. So we started experimenting and writing and at that point, 1970 – 71, he had a TEAC two-track tape recorder up in his apartment and we used to go up there and experiment, write songs and try different things – and we were out playing but there were only a few clubs out around Chicago that allowed you to play original material. There were a few clubs on Lincoln Avenue like The Orphan and The Bulls, which was more of a Jazz Club in Lincoln Park - they allowed you to come up and play original music – and it was tough sometimes because it was like we were starting over again. Being just two guys with two acoustic guitars – and the crowd was kind noisy – it was tough to be heard and get their attention and play over that – so it was a bit of a struggle until late in 1972 when Jon Poulos, who was managing us – he had stopped playing drums – got Lou Adler’s attention – and, of course, Lou had just come off of winning all those Grammy Awards for Carole King’s album, “Tapestry, and he heard a demo we did – we recorded a demo at RCA in Chicago – with the group Poco – they backed us up – and one of the songs we did was “Music Everywhere”, a song that I wrote – so I played guitar on it and we had Timothy B. Schmit on bass and Poco’s drummer and Dennis and I did the vocals – so Jon Poulos sent Lou Adler the demo and he got excited about it – he really liked it – and the next thing we knew, we were in LA in the studio playing – and Lou had just finished a session with Carole King and Lou had us set up with four microphones and we just went through our repertoire of songs and it was a pretty heavy experience for us – you had a lot of superstars coming in and out of the studio at the time checking out who Lou was listening to – so Carole King was there - her and David Geffen, Jackson Browne – there were a few people coming in and out – so that was the beginning of the first album we did – we took all our original material and Lou Adler produced it and put it out there and we had moderate success with it – but I will say that Lou Adler gave us a great, great opportunity – we just didn’t come up with the hits. We just didn’t come up with the single. But that’s where my interested started – my excitement about writing songs and seeing a song come to fruition in the studio and create with that – I’ve been excited about doing that all the time. Several years back I did this album for The Buckinghams called “Reaching Back” and I was very hopeful because I wrote a whole bunch of songs that sounded a lot like an old batch of Buckinghams tunes – they had the chord changes, the structure, the symphonic sound and the horns – commercial pop tunes – and we put them on the album along with the hits and we had some moderate success with it but once again, it’s hard to get our audience to buy new music. It was a new album for the group – but I don’t think I’ll ever go back to trying to record original material for The Buckinghams at this point in our career. We may do another live album somewhere down the line – that’s always a possibility – but I don’t think our fans are interested in hearing any new music by The Buckinghams – so I’ve reserved these projects to do under my own name where the prospect of success isn’t tied so much to the band. Like I said, I’m not expecting to come up with a solo million seller at this point – but I have a need to get this music out and this is my release – my way of doing so. kk- Well, I think it would be great to go out and showcase some of these new tunes with some of the musicians you worked with on the album – do a little Q&A with the audience – tell some of the stories behind the songs – tie it into a book signing opportunity and then close the show with a six song Buckinghams hits set – now you’re talking about the COMPLETE package! CG- People are always asking me about that – and, believe it or not, we are close to finishing it and we finally got a publisher interested, too, and my idea was to go out and promote the book and put something together and play songs out there live from the new album. CG – Well, that was the idea. I did an album a couple of years ago called “My Journey” that I ran a bunch of extra copies of – in fact, I probably have a couple thousand copies of it sitting here – and on that album I took all The Buckinghams hits – even ones like pre-“Kind of A Drag” songs like “I’ll Go Crazy” and so forth – and Tufano and Giammarese songs, too – and I did them all in an unplugged format and my idea was to give those cd’s away with the book when it comes out – go out and promote the book and do book store appearances plus whatever venues I could do, small venues, and do like a Questions And Answers segment with the audience, tell stories from the book and play some of the cuts – so that’s still sittin’ out there – I won’t say it’s on the back burner – but it’s still something I’d like to do at some point. All we need now is to get the book published and get it out there and that’ll be part of it. And I can also take some of the cuts here from “Living in The Moment” and do those, too. kk – Well, I think it’s a great idea – it’s a whole different show at that point, too – and now’s the time to do this – you’ve got the whole Cornerstones Of Rock thing going – Jim Peterik just had his successful book out and he’s done some show with his reimaging of some of his best-known songs – and so it’s really a good time to take advantage of that because you’ve got a little bit of momentum behind you right now. kk – Yeah, I’m hoping to get to that. I’ve missed a couple of these now but finally made it to the last one. Speaking of which, has anything happened with – I know there’s been some talk about a Midwest tour with all the Cornerstones acts – has anything moved forward with that now that the television special is airing in other cities? The agent who’s taken the lead – and also Ron Onesti – is trying to make that happen – I don’t know – we had one show that was booked in the Minneapolis area – but TWICE it fell thru because of lack of ticket sales. kk – Oh no, I didn’t know that – I thought those shows had gone off as planned. CG – No, and it was supposed to happen – and I think that whoever was promoting it dropped the ball and the timing was off – it was supposed to coincide with the airing of the show up there and then that didn’t happen. Let’s face it, I think one of the hardest things about selling that show on a national level would be that a lot of the groups don’t have the national name like say The Buckinghams’ name – but there are a lot of cities that I think would work for us – like Indianapolis and St. Louis … and this Minneapolis / St. Paul date should have worked for us too. kk – I would have thought ANY Midwest dates would have made for a hot ticket – people were listening to WLS all over the country back then – we’ve heard from SO many readers over the years who would hear a song on WLS say by The Cryan’ Shames or something and then go into their local record store 800 or 1000 miles away and find out that they couldn’t buy it because the record wasn’t getting played in that city – but that 50,000 watt signal beamed all over the country back in the mid-‘60’s. CG – Yeah, Milwaukee, Madison – I mean there’s a lot of venues – so I know they’re trying to do that – and I think it will happen – I think we’ll start seeing some dates jump up for the tour – and it’s a really good show and it’s exciting – and boy, they did a really good job of producing that show – Joe Thomas did a great job of putting that together – it sounds great, it looks great – so hopefully we’ll do more of that. I’m hopeful that I can go out and put something together and play some of these songs live. There’s one cut here, “Whisper And A Sigh” – that was the first cut that I wrote for the album – and I just thought it was so contemporary – it sounded so much like what you’re hearing on the radio today – it’s basically a love song lyrically but I thought that it would have attracted some attention – and I haven’t given up on getting this album out there – we’re doing a little promotion thing now for the holidays so you’re going to start seeing some things up on Facebook and my Facebook Page – I’ll send you a copy of some of the promo stuff that we’re doing. kk – You know that anything we can do to help get the word out there we’ll do – hopefully this interview will help to get some of the word out there – I need to do this quickly because I’m kinda winding things down now at the end of the year because come the first of the year we’ll be launching brand new series - an entire year of looking back at 1967 – and I’m really hoping all of you guys will help participate with that because 1967 was such a huge, huge year for The Buckinghams – so maybe you can share some stories, some comments, some memories – maybe some photos that people haven’t seen before – personal milestones, that kind of thing. CG – Oh yeah, sure – I’d be glad to do that – Oh God, ’67 – The Summer Of Love – that was our biggest year! That was unbelievable – it’s actually our 50 Year Anniversary coming up of when “Kind of A Drag” got the #1 Record. kk – Yeah, and you guys got the Cash Box Award that year, too, so it’s a big, big year for The Buckinghams. Let me just say, too, that “Whisper and A Sigh” and the title cut “Living in The Moment” are my two favorites on the cd – they’re the perfect bookends for this cd – it’s interesting that they start and finish the album because it’s a very strong launch – I think “Whisper And A Sigh” is a VERY strong opening track – and I think it kinda helps to set the tone for the album – and then a couple that I mentioned before that kind of have that Eric Clapton feel to them – I love the gospel tune – there’s just such a wide variety of styles on this. CG – Yeah, and it WOULD be a fun cd to perform live – I really appreciate you saying that – it’s always great to hear any kind of significant media person say something positive about something that you’ve done – but it would be a fun album to go out and play some of these tracks live. kk – Oh, I agree – and let’s face it , you can always come back and do a six song Buckinghams finale for the encore if you have to – I really like the idea of tying it all together with the book, some stories, the new tracks, all exciting stuff. 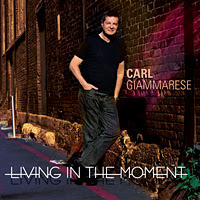 Head on over to www.carlgiamarrese.com to pick up not only Carl’s latest cd, “Living In The Moment” but all of his previous solo work can be found there, too. kk – Well, as always, please keep me in the loop – I’m always happy to pass that information along. CG – And anytime you need anything for 1967, just drop me a line. Let me just end by saying thank you for the opportunity to talk about this – it is appreciated – and have a very happy and healthy holiday season – let’s have a great new year. kk – And thank you as well – the same to you and yours. I find it to be an extremely enjoyable experience as Carl takes on ten brand new, self-penned tracks encompassing any variety of different styles yet flowing them seamlessly throughout the new LP. I had the chance to sit down with Carl and talk the day before Thanksgiving and we went through the album track by track, as well as covering a few other topics along the way. Today and tomorrow I will share those conversations with you … along with some prime Giammarese tracks. This was the first song I wrote for the album. It’s all about having intense love for someone. With A Whisper and A sigh, that’s how I, think of you. It’s so hard to reason why, when love runs high, what can I do. Every night I think about you since you’ve been gone. You were the one that got away. Try to live without you it’s hard to go on, can we go back to yesterday. To all those who have a significant other supporting you through life’s challenges. I have been very fortunate to have that person. And when the stars come out at night, you are there to hold me tight. And like the leaves upon a tree, you make me a better me. To my brother Buckinghams in those late great 60’s. Oh what a time we had together, we were brothers in every way. We knew it wouldn’t last forever, it doesn’t matter, it’s okay. It’s all about lost love, I had a few friends in mind as I wrote this, and they will know who they are. She was that woman to you, that comes but once in your life, wrong or right, what you would give to have her, one more time. I wrote this at a low point in my life but these words helped me get through it. It’s all about having faith and fulfilling your dreams. With all the ups and downs in life, just believe, and in the end it will work out and be alright. What can I say … anyone who’s had someone walk out or cheat on them can relate to this. It’s an old topic written about more than any other subject in song. Oh its so true, it happens all the time. I wrote this song right after my father passed away in 2002. I sat late one night still feeling his presence which inspired me to write it. I am honored that a few Christian Music artists have record “Oh Lord” and made it their own. Could I ever be what you want me to. I find myself reflecting on the past quite a bit, I guess it can’t be helped to some extent when you reach a certain age. I am also guilty of thinking about the future too much and my own mortality. I realize that it’s all about “Living In The Moment” … and that’s all I’m trying to say in these lyrics. Hopefully I can live by them. This is the title track and another extremely strong track on the album – I think it’s kinda cool how it turns into a country hoedown … reminiscent of what Jim Peterik did on his last album, “The Songs”, where he re-imagined some of his best known work. I cannot help but wonder if this was an influence of sorts. My EXCLUSIVE interview with Carl Giammarese in conjunction with the new LP … and just some “life in general” stuff, too. Enjoy!